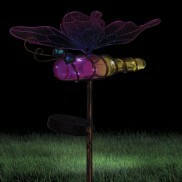 From cute and quirky to stylish and contemporary, Solar Ornaments give your garden character and light. 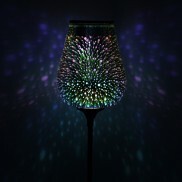 See your garden burst into a riot of colourful light from this stunning solar droplet stargazer garden light! 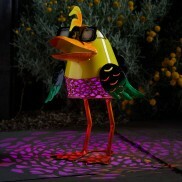 What cooler way to add a splash of colour and light to your garden than with this quackers solar Doctor Duck decoration? 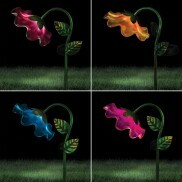 See your garden burst with colour night after night with this multi coloured LED solar flower burst light! 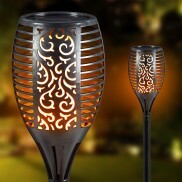 Contemporary, stylish and lit with clever real flame effects, this flickering flame solar torch allows you light your garden with delicate dancing flames without any risk! 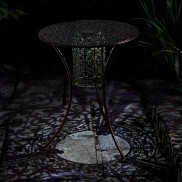 A stunning antique effect metal patio table that is lit from within for stunning scrolling shadows night after night. 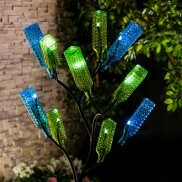 Give your empties a new lease of life and transform bottles into a stunning garden decoration with a solar bottle tree! 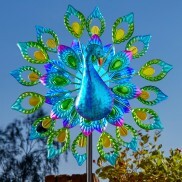 Elegant and full of colour, this beautiful solar peacock garden light adds serious style to your garden. 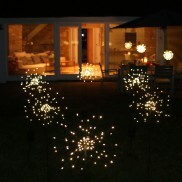 Twin wind spinners swirl in the breeze and are lit by a colour change solar crackle glass ball to make a stunning garden decoration. 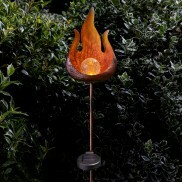 Enjoy the warmth of flickering flame effects from this stylish rustic solar stake light night after night! 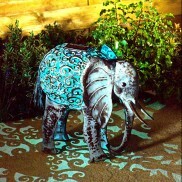 Add a majestic focal point to your garden with the elegant metalwork silhouette of the Solar Elephant. 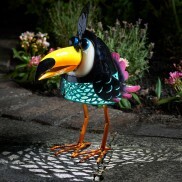 Wide eyed and staring in a look of amazement, this eccentric owl shines with beautiful silhouettes night after night. 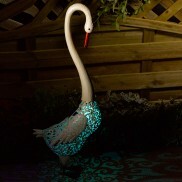 Beautiful and serene, this elegant swan garden light adds subtle mood lighting to your garden with scrolls of colour. 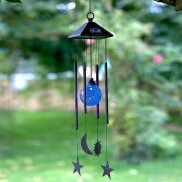 Achieve zen like calm in your garden with colour change light from the solar sun and moon wind chime. 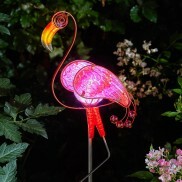 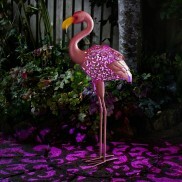 A kitsch addition to your garden, this playful flamingo light gives your garden a feel good tropical vibe. 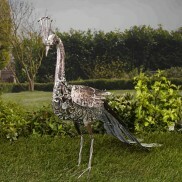 The majestic Solar Metal Peacock is just the thing for adding character and light to your garden. 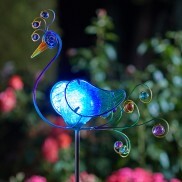 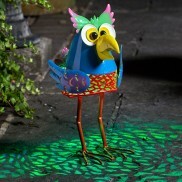 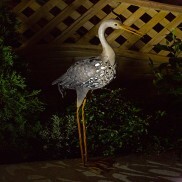 Standing tall and proud, the Solar Metal Heron adds character and colourful light to your garden. 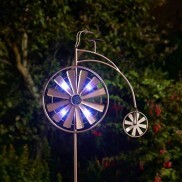 A charming addition to your garden, this stylish Penny Farthing bicycle's front wheel rotates in the wind creating a circle of light at night. 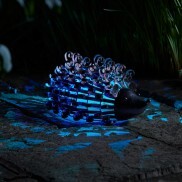 Bring the woodland into your garden with a sweet little hedgehog that lights up your garden night after night. 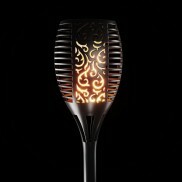 Brand new Trueflame technology allows this stunning solar garden torch to mimic real flames even during the winter months! 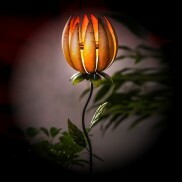 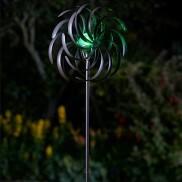 Add a splash of colour and light to your garden borders with a super sized lotus flower solar stake light! 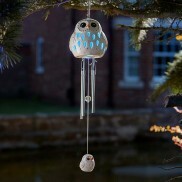 An atmospheric snowy owl windchime that creates music in the breeze and shines with a colour change glow. 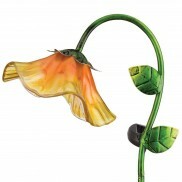 Add a splash of cheer that only a suflower can bring with this snazzy solar sunflower light! 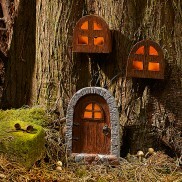 Fairies really do live at the bottom of your garden and their little windows light up every night! 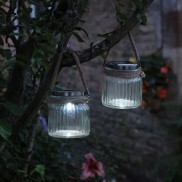 Illuminate your garden with rustic seaside charm hanging enchanting cornish sea lanterns from trees and trellises. 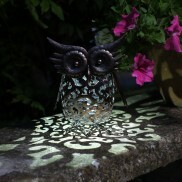 A sweet solar powered owl lamp that casts decorative swirling shadows when lit for a warm, atmospheric glow. 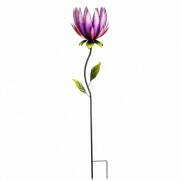 Brighten up your garden with a splash of colour and gentle light with a purple lotus flower solar stake light. 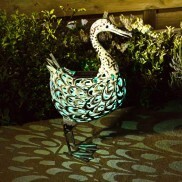 Introduce a fun and decorative addition to your garden with the quirky Solar Metal Duck. 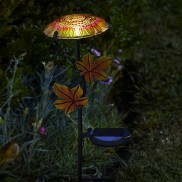 Perfect for brightening patios or bedded areas and adding a little rustic charm. 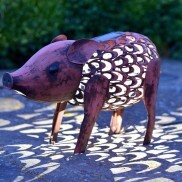 Add instant character to your garden with the adorable solar silhouette pig with colour change and white light functions! 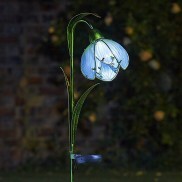 Add colour and light to your pots and borders with a stunning hand painted mini bell flower garden stake light. 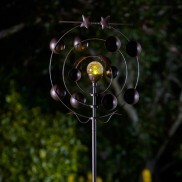 A striking focal point for your garden, this stunning wind spinner resembles a solar system with a colour change crackle glass ball at it's centre. 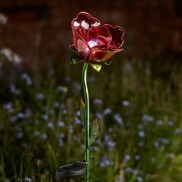 Illuminate your garden borders with a pair of romantic red roses that light up and shine with a magical glow. 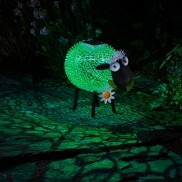 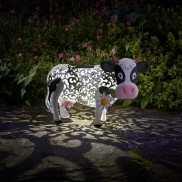 A sweet solar powered cow that casts swirling shadows onto surrounding surfaces when lit by colourful or white light. 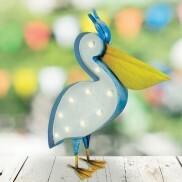 A sweet vintage styled solar pelican garden decoration that illuminates your space with warm white light. 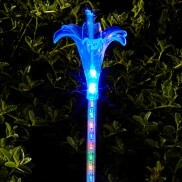 Hand painted and lit with LED fairy lights, solar butterfly garden stake lights add a splash of colour to patios, pots and borders. 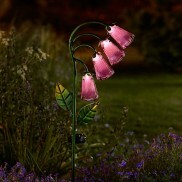 Brighten up your borders with beautiful Foxgloves that are always in bloom and shine night after night with a stunning warm glow. 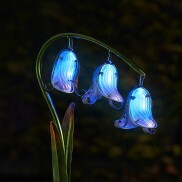 These stunning solar bell flowers make an impact in your garden with vibrant colour and a gentle glow. 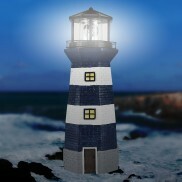 Add a fun touch to your garden with the nautical striped Solar Light House, complete with rotating light! 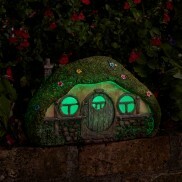 A hint of magic for your garden, this adorable miniature fairy house lights up with colour change and warm white light. 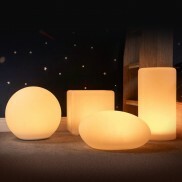 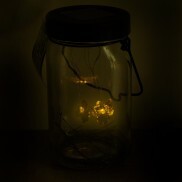 A trendy glass jam jar filled with a trio of sweet LED fireflies for magical garden mood lighting. 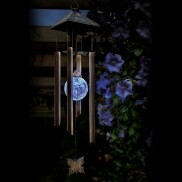 Combine sound and light perfectly with the Solar Colour Change Windchime, modern and sleek outdoor lighting with a unique edge. 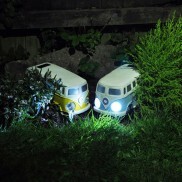 Add feel good retro vibes to your garden with a solar powered campervan and see its headlights illuminate your garden every night! 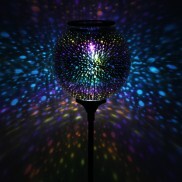 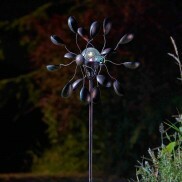 See your garden borders explode with colour everynight with the super stylish solar sphere stargazer stake light. 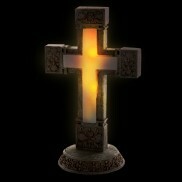 Give part of your garden to the memory of loved ones with a solar powered cross light. 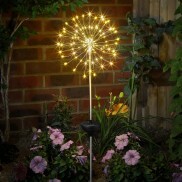 See your borders and flower beds come to life in an explosion of warm white enchanting light effects! 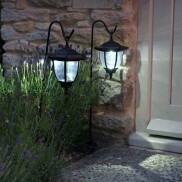 Add traditional charm and gentle light to your garden with ageless solar coach lanterns on shepherds crooks. 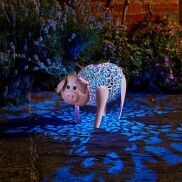 A sweet decorative piggy that glows with white and colour change LEDs casting pretty scrolling effects into your garden.